Airdyne Aerospace Inc. | 'Harvester' Could Transform Any US Air Force C-130 Into A Nuke Sniffing Plane - Airdyne Aerospace Inc.
With its two WC-135W Constant Phoenix atmospheric sampling jets becoming increasingly difficult to operate and maintain, the U.S. Air Force is looking for additional ways to rapidly scoop up air samples after nuclear weapon tests and other atomic incidents. Since three replacement WC-135Rs are still years away from delivery, the service may soon turn to a modular kit that can turn a C-130 Hercules into a nuke-sniffing WC-130 as necessary. According to a report by Defense News, two of these systems, known variously as the Particulate Airborne Collection System (PACS) or Harvester, will be in service and operational by the end of 2019. Though the Pentagon did not request any additional money for the program in its latest budget request for the 2019 fiscal year, the outlay does note that the U.S. military has spent more than $1.5 million on the effort since it began in 2012. The full Harvester system consists of two separate collection pods. These hang below the C-130 while it’s in flight to gather air samples potentially full of nuclear debris, as well as a workstation for the system’s operator. According to Sandia National Laboratories, which led the initial development of the equipment, during an actual mission, the system operator would first use the Directional Gamma Radiation Sensor (DGRS) to pinpoint the radioactive plume. This particular component consists of four large sodium iodide radiation detectors and a complex processing algorithm. Various Sandia-developed air-sampling pods. Harvester is at the far right. The aircraft would then fly through this “hot spot” collecting particles, which would get caught in a piece of specialized filter paper. Harvester has its own radiation sensor that can provide immediate data on the possible types of isotopes and how densely they’re concentrated in the air. Once the plane lands, specialists on the ground can physically remove the filters for more detailed analysis. Harvester is also a modular affair that will work on any of the Air Force’s C-130H or J model airlifters thanks to Canadian firm Airdyne’s Special Airborne Mission Installation and Response (SABIR), which you can read about more in detail in this past War Zone feature. This system is essentially a replacement for one or both of the Hercules’ rear paratroop doors that adds an extendable arm with a standardized bomb rack into the aircraft. A C-130H belonging to the Pennsylvania Air National Guard’s 193rd Special Operations Wing fitted with the SABIR door and carrying a podded psychological warfare system. Personnel can then link this system, and any sensor pod or other stores it carries, to a workstation inside the aircraft. In Harvester’s case, SABIR systems on both sides of the aircraft each hold a single collection pod. This combination offers the Air Force significantly more flexibility over the existing WC-135Ws and the future WC-135Rs. The 21st Surveillance Squadron, part of the service’s secretive Air Force Technical Applications Center, or AFTAC, the service’s main nuclear reconnaissance unit, “owns” the systems, but has no aircraft and will have to coordinate with airlift units as necessary to fly actual missions. The inside of a harvester pod where the filter would go. This arrangement could provide a badly needed backup capability in case the existing Constant Phoenix jets are not available. With only two of them to begin with, it doesn’t take much for accidents or heavy maintenance to bring aerial sampling missions to a halt. One of the two WC-135W Constant Phoenix aircraft. With the smaller C-130s, the Air Force would be able to fly collection missions from a more diverse set of airports and airfields, as well. This could offer a more responsive capability during a contingency whether it be an accident or attack of some sort. The Harvester program actually began first as part of efforts to develop capabilities to guard against domestic nuclear incidents. In 2013, Sandia conducted the initial flight tests of the pods on a Customs and Border Protection MQ-9 Reaper drone. A Customs and Border Protection MQ-9 carrying the Harvester system during a test in 2013. According to one Pentagon presentation in 2015, one concept of operations would involve flying a Harvester-equipped aircraft over an incident site and then having it return to a safe and secure airstrip where technicians would quickly prepare samples for analysis in a laboratory by way of a rapidly deployable clean room. In this way, the U.S. government could quickly identify the exact nature of a potential nuclear incident and respond accordingly. The possible scenarios could range from a terrorist with a “dirty bomb” to a rogue state launching a ballistic or cruise missile with a nuclear or radiological warhead at an American facility abroad or a city at home. 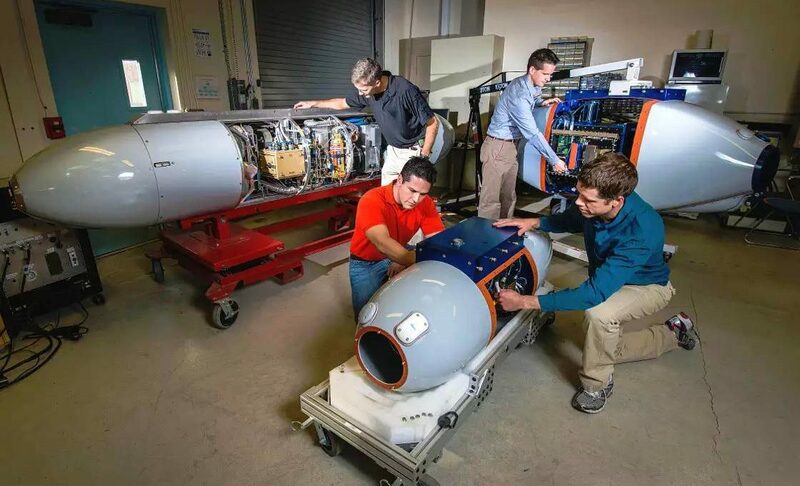 In its most recent budget request, the U.S. military says that Harvester’s primary mission will still be to support the Department of Homeland Security-led National Technical Nuclear Forensics (NTNF) effort and its own Countering Nuclear Threats (CNT) mission. U.S. Special Operations Command recently assumed the role as the lead agency within the Pentagon for countering all weapons of mass destruction. With that in mind, the Air Force’s special operations MC-130s or MQ-9s could easily carry the pods if required. A 2015 briefing slide showing Harvester among other potential developments to support rapid sampling and analysis after a nuclear or other weapons of mass destruction-related incident. Still, Harvester-equipped C-130s won’t be able to completely replace the WC-135s. The podded system can’t collect and analyze nuclear gases, which the Constant Phoenix jets can do with their larger sampling system. There is a separate Modular Whole Air Airborne Collection System (M-WACS) in the works that could give the aircraft this additional capability, but it is unclear when it will be operational. Even so, the C-130s also don’t fly high or fast enough, or have the overall range, to perform the kind of sampling necessary to support AFTAC’s primary mission of monitoring compliance with the Limited Test Ban Treaty and other nuclear arms control agreements, Susan Romano, a spokeswoman for the center, told Defense News. Harvester is really better suited to fill a capability gap between the more capable systems on the larger WC-135s and the more limited suites on smaller platforms, such as the National Nuclear Security Agency’s fixed wing and helicopter-mounted Aerial Measuring System (AMS) and the Environmental Protection Agency’s Airborne Spectral Photometric Environmental Collection Technology (ASPECT) aircraft. As such, the Harvester-equipped C-130s will also help free up the WC-135s for missions that truly require their more extensive sampling systems. And together, the two types of aircraft will expand the Air Force’s overall capacity to perform this vital mission.